The New York Mets wanted to make a powerful statement during Sunday night's game by wearing the hats of the agencies that sent first responders into the World Trade Center on Sept. 11. Major League Baseball, however, said no. In a decision that's already drawing plenty of criticism — and rightfully so — league officials said the Mets could not wear hats with 'FDNY' and 'NYPD' printed on them during the nationally-televised game against the Chicago Cubs. The move would have been a nod to the last month of Sept. 2001, when the Mets wore similar caps given to them by firemen and police officials at Ground Zero — and by some of the families of those who perished on Sept. 11. MLB, however, couldn't — or rather, wouldn't — budge from its original edict that all teams wear hats with a small and simple flag embroidered on the side. When the Mets made a move to continue wearing the hats after pregame ceremonies, they were told that the team would be hit with a heavy fine. Joe Torre, MLB's executive vice president for baseball operations, told The Associated Press the decision was made to keep policy consistent throughout baseball and that "certainly, it's not a lack of respect." ... MLB issued a league-wide memo on uniforms for games played on the 10th anniversary, saying teams must wear their everyday caps with a small flag on the side. The league originally told the 2001 Mets that they could not wear the hats during the games, either, but as former Met Todd Zeile remembered for reporters on Sunday, "it was really a collective feeling from everybody in the clubhouse that ... we're going to wear these hats until we can't wear them anymore, until they're ripped off our heads.'" So why would MLB make such a decision when even the usually-draconian NFL relaxed its rules when it came to uniform tributes on the 10th anniversary of 9/11? ESPN's Buster Olney reported that MLB felt the hats were "sacrosanct," which may explain why Torre — who was as close to 9/11 as any other sports figure and should be able to recognize the tribute — said what he did. I also got the sense that baseball was looking to be as respectful as they could this weekend and not appear that they were trying to put a commercial spin on the tragic milestone. This ruling, however, just doesn't make sense. 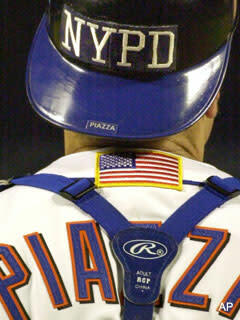 The first responders and their families did not raise any issues when the Mets wore the caps in 2001 and wearing them on 2011 would have been a nice way to bookend what was a very memorable part of baseball's role in the Sept. 11 healing process. Also, if MLB was worried about keeping control of the uniform tributes, they could have ruled that only the two New York teams and the Washington Nationals had the choice to wear organization-specific caps. But in nixing the Mets' plans to honor our courageous and our brave, baseball prevented the Mets, their fans and the city of New York from paying the highest form of tribute to those brave men and women while re-enacting one of the sport's most admirable moments. Joe Torre and his crew should have known better.